I eat a lot of meat. A lot! And I generally buy it from a butcher in LA that I love and trust (Lindy & Grundy's). But often times I will also get my steaks and bacon from other places. In many cases the products I buy have labels on them that make it sound like the animals are raised in the grass swept hills of Austria. So I decided to actually figure out what some of these terms that are used mean. In general I found the terms are largely meaningless. There are many loopholes in FDA regulations and in some cases marketing terms that are used aren't even regulated by the FDA. Most poultry is raised in CAFOs (confined animal feeding operations). These are not the chickens you are looking for. The loopholes and disingenuous marketing for poultry is probably the worst of all types of meats. The one sure-fire method I use to figure out if a chicken is probably raised in a healthful way is by its size. Real chickens grown naturally and fed naturally are tiny. Really tiny. And they are pricey. The bigger it is and the cheaper it is the more I would be worried. The only terms that matter are "antibiotic free" and "pastured". But you are still going to need to verify that they eat bugs at some point if you want a really good chicken. "Cage Free chicken" - Meaningless. No chickens or turkeys are raised for meat in cages anywhere in the world. All those chickens you've seen in cages are egg-laying hens. Cage-free eggs is probably a good thing to consider. "All vegetarian diet" - Meaningless. Poultry are generally omnivores. What they prefer to eat is a worm or bug. It's not clear that a vegetarian diet is good for chickens. "Free range" - Generally meaningless. The FDA definition states that birds must have "continuous access to the outdoors during their production cycle". Note the word access. They don't need to actually use that access. Typically farms will install a 'cat door' attached to one end of the warehouse-style confinement house. In theory the birds could wander outside into a dirt lot but the reality is they are not aware of it and in their lifetime may never even wander past the door given the size of the CAFO houses. "USDA organic" - Generally meaningless. This means a lot of things. There are many loopholes. What it doesn't mean is that the chicken is raised outdoors. Much like free range it only requires that a 'cat door' is installed. In general these birds will be CAFO-raised and fed certified organic feed without antibiotics. "Grass" terminology - Meaningless. "Grass prairie poultry" or "grassland poultry" typically are only trade names. They mean nothing. One company that uses these term grows their chickens CAFO style but with access to some sunlight (aka a skylight in the warehouse). There's no grass anywhere in their growing process. "Hormone-free" - Meaningless. Federal regulations have never permitted hormone use in chickens. All chickens are hormone free. "Antibiotic-free" - Meaningful. This is a legitimate claim. Antibiotics are not used in a therapeutic sense but to make the chickens grow faster. Most chickens are raised on antibiotics. "Raised on pasture" and "Pastured" - Generally meaningful. Both terms mean the same thing. The chicken was raised outside instead of a CAFO warehouse. But it does not mean they eat grass and bugs. Almost all pastured chickens eat a supplemental diet of soybeans, corn and possibly some protein meal. Like chickens, pork is raised CAFO style. What I look for in pork is that they are pastured and also the look of the meat. Good pork is well marbled, particularly around the perimeter and the fat is pure white. The meat also has a noticeable color different from crappy pork. I'll add some pictures at some point of good versus bad so you can see the difference. Also many brand names are not what you think they are. Niman Ranch has a great reputation but most of their meat is purchased from other farmers and the company that started with solid pig husbandry was bought out and now is a total joke. "All-natural" - Meaningful but not what you think it means. Not an FDA defined term. But the FDA has said they do not object to the term being used if the food does not contain added color, artificial flavors or synthetic substances. It has no bearing on how the pig was raised. Only how its meat was treated after slaughter. So yes all natural is good but it is insufficient. "Deeply bedded barns" - Meaningful and bad. These are CAFO warehouses raised pigs. Often a farmer or branded company will say they raise their pigs "in pasture or in deeply bedded barns." See that "or"? Breed names - Meaningful. Unless a meat says it is one of the better breeds like Berkshire, Kurobuta, Duroc, Chester White, or Mangalitsa then it is most likely a modern breed genetically developed by a company like PIC. But beware if it says it's a mixture or blend of those breeds it is still a genetically developed pig. Are these bad? I'm not sure. But why not just buy a Berkshire? "Premium" - Meaningless. This term means nothing. It's only a marketing term. "Hormone free" - Meaningless. No pigs are raised with hormones. It is illegal. "Antibiotic free' - Meaningful. Most pigs are grown with antibiotics and other growth inducing chemicals. Paylean is the most commonly used chemical (also called ractopamine). It reduces the fat production on a pig so the meat is lean. Paylean is banned in Russia, china, and the EU. "Free Ranging Outdoors" or "Pastured" - Meaningful. Not to be confused with "Free range". Pigs must be raised outdoors where they can feed on grass and other green matter. "Free Range" - Meaningful but worthless. Similar to poultry where the pigs are raised CAFO style and have a 'cat door' to get outside. "Crate free" - Meaningful but maybe not good. Piglets are typically weened in a cage. Often called a gestation or farrowing crate. Gestation crates are tight and inhumane. Farrowing crates might actually be good because many piglets are crushed by their mothers. More than you would think. These crates are bigger than gestation crates. "Grass fed" - Meaningful but unusual. Unlike cows, pigs need a good source of protein in the form of bugs. This can be hard to do with a large number of pigs. So typically pastured pigs will be fed a protein supplement. It isn't necessarily bad. But grass fed would be preferred. Baby cows are typically bred at "cow-calf farms". They are then sent to "feeding farms" or "feedlots" to be raise to adulthood in 4-12 months. Feedlots generally feed cows corn and soy but many other horrible things can be added like urea and even candy. Beef is a tough one to buy well. Again I generally use visuals as a clue and in particular look at the fat on the meat as a clue to its quality. Grass-fed is a good and meaningful term as long as you are aware the farmer isn't using some sneaky loopholes. "All-natural" - Meaningful but insufficient. This refers to how the meat is handled after slaughter. it has nothing to do with how the animal is raised. This meat is free from added color, artificial flavors or other synthetic substances. Niman Ranch for example buys all their "all-natural beef" from feedlots (as confirmed by Bill Niman, the former owner and original founder). "Pasture-fed", "pastured", "pasture raised", and "free-range" - Meaningful but insufficient. It means the animal was raised in a pasture of some form but it doesn't mean that they ate grass. "Antibiotic-free" and "Hormone-free" - Meaningful. Most beef in the U.S. uses both substances. Both are added to the daily food ration not as therapeutic but to grow cows bigger and faster. The hormones used are generally either estrogen or androgen hormone pellets. The pellet is implanted under the skin of the ear. "Certified Organic Beef" - Meaningful but insufficient. A certification regulated by the USDA National Organic Program (NOP). It states that the animals must be raised on "pasture [with] daily grazing throughout the grazing seasons." Sounds good but there is a loophole. The regulation states that "yards, feeding pads, or feedlots" may be used for ruminant slaughter stock as long as the feedlot feeding period does not exceed 120 days (or 1/5 of the animals total life). This certification does mean that they are hormone and antibiotic free however. It does not mean the cows eat grass. "Grass fed, grass finished" - The USDA standard for grass fed beef requires that grass and forage be the food source for grass fed cows for the entirety of the animal's life. The term grass finished is not necessary. Grass fed implies grass finished. But alas there is another loophole. The regulation allows the use of grain to ensure the animal's well being at all times. So many farmers will used 2% by weight of grain in the cow's food during the winter months. Not 2% of the food. 2% of the weight of the cow. So grass fed beef often is partially grain fed. I thought I'd end with an example. 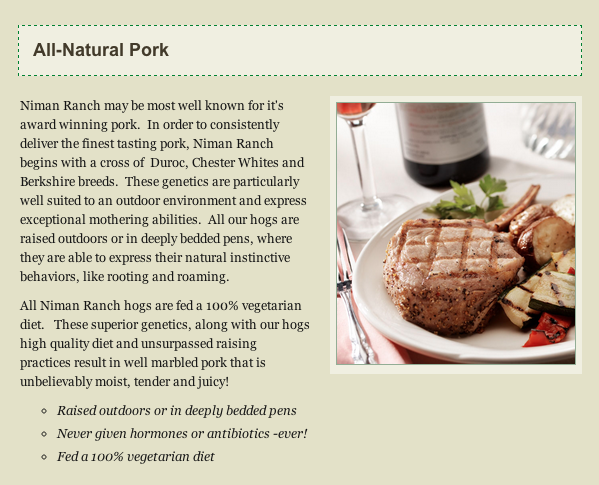 Here's Niman Ranch's pork page. Looks good! Their pigs are a cross of Duroc, Chester Whites, and Berkshire breeds. This means they are using genetically engineered pigs. Not necessarily a bad thing. But again, why? The genetics are suited to an outdoor environment. But it does NOT say they are raised outdoors. All hogs are raised outdoors OR in deeply bedded pens. So 100% of their pork could be raised in CAFOs. Hormone-free! No pigs are raised with hormones. Vegetarian diet. Pigs are omnivores and eat bugs and rodents. Feel like you are being taken advantage of? You are. Niman Ranch is now owned by a private equity firm. Bill Niman hung around after he sold the ranch but left in 2007 after arguments with management over how the meat was raised and treated. And one last factoid. Bill Niman is a vegetarian!